Children’s social and emotional health affects their overall development and learning. Research indicates that children who are mentally healthy tend to be happier, show greater motivation to learn, have a more positive attitude toward school, more eagerly participate in class activities, and demonstrate higher academic performance than less mentally healthy peers (Hyson 2004; Kostelnik et al. 2015). Children who exhibit social and emotional difficulties tend to have trouble following directions and participating in learning activities. Compared with healthier peers, they may be more likely to suffer rejection by classmates, have low self-esteem, do poorly in school, and be suspended (Hyson 2004; Kostelnik et al. 2015). Thus, children’s social and emotional health is just as important as their physical health, and affects their capacity to develop and potential to lead a fulfilling life. Teachers can promote children’s social and emotional health in many ways, for example, by organizing a material-rich environment to stimulate social interactions among children. This article focuses on two of the most important practices: building trusting relationships and conducting intentional teaching. Children benefit socially, emotionally, and academically when teachers intentionally create close, trusting relationships (Palermo et al. 2007). But gaining the trust of every child is not as simple as being nice and engaging. How can teachers create trusting relationships with all of the children? Consistently offering warmth, affection, respect, and caring is essential. Ms. Johnson displays a pleasant facial expression throughout the day. She smiles when greeting children in the morning, says goodbye in the afternoon, and acknowledges children’s appropriate behaviors. Mr. Logan uses the appropriate tone of voice at all times. His speech is at normal pitch and volume; his tone is relaxed and soft. Even when he has to redirect a child’s behavior, he remains calm and warm to convey that his concern is with the behavior—not the child. Ms. Aragon gives appropriate touches when necessary, such as a pat on the back, a handshake, hugs, and brief tickles. Ms. Lizama moves physically close to the children and bends or crouches to be at the children’s eye level while talking to them. Mr. Sharma often uses loving comments to show he cares: “I am so happy to see you this morning!,” “I missed you yesterday,” “I love seeing your smile!” And he is careful to make such comments to all of the children in his classroom. Listens with full attention and restates what children say (often also seizing the opportunity to expose the children to new vocabulary). Jason, a 4-year-old, says, “Look, I made a truck with lots of Legos!” Ms. Carnes replies, “Oh, I see, Jason. You built a truck with dozens of Legos.” Jason adds, “I use this truck to deliver apples and bananas to the grocery store.” Ms. Carnes responds, “Using a truck to deliver nutritious fruits to the grocery store is helpful.” Listening to children attentively and reflectively enhances their self-worth and confidence. When teachers actively listen to children, they convey that they care about what the children have to say, and the children are more likely to share their thoughts, ideas, feelings, and stories. Accepts and reflects children’s feelings. Frowning, Jasper says to the teacher, “Michael has all the big blocks!” Ms. Carnes responds, “Jasper, you seem upset that there are no more large blocks to build with right now. It is difficult to wait!” Amy says with enthusiasm, “We are about to go outside!” Ms. Carnes answers, “The sparkles in your eyes tell me you can hardly wait to go outside. You are excited.” When they accept and reflect children’s feelings, teachers exhibit sensitivity and caring in a way children understand. Teachers’ acknowledgments make children feel heard and accepted (Duffy 2008). As a result, children feel safe to express their emotions—and receive support in identifying, labeling, and better understanding their emotions. Spends private, quality time with individual children through one-on-one activities, such as story reading and game playing. Emily is sad when her mom leaves. Ms. Carnes reads her a book in a cozy corner with soft pillows and stuffed animals. Afterward, Emily is ready to explore and play in the classroom. Judy complains that no one wants to play with her at the tactile table. Ms. Carnes sits at the table and plays with Judy until another child joins the play. 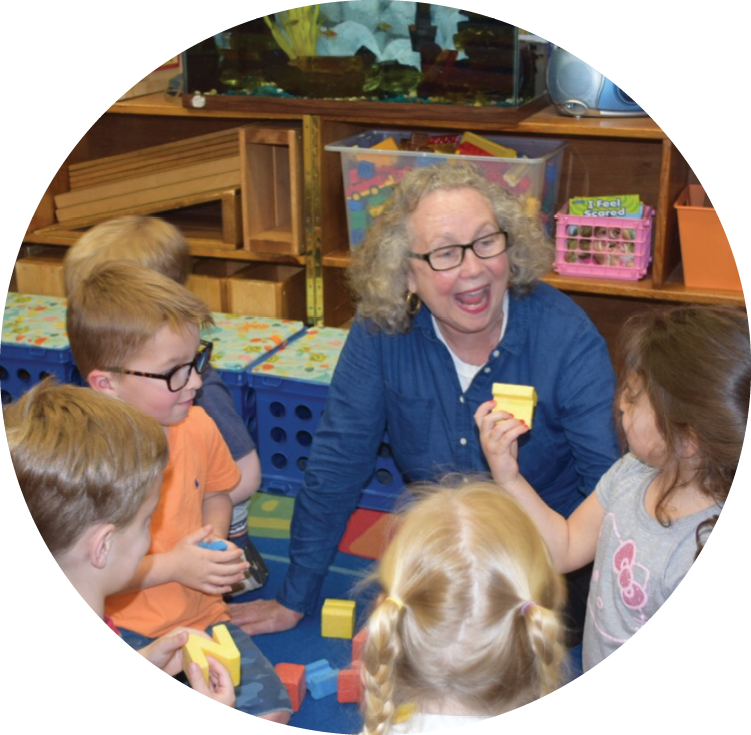 In addition, Ms. Carnes spends quality time with individual children by putting aside other work, moving to the child’s level, and conversing openly with the child. Ms. Carnes keeps track to ensure that she speaks with each child regularly, which deepens their relationship and builds trust (Gartrell 2007). Ms. Carnes finds time for these conversations throughout the day, especially during greeting, free play, snack, lunch, and departure time. Helping children develop social and emotional skills is the heart and soul of any good program for young children (Gordon & Browne 2014). Teachers (and all caregivers) play key roles in helping children develop social and emotional competence (Kostelnik et al. 2015). Teachers can intentionally support children’s social and emotional health by using children’s books, planning activities, coaching on the spot, giving effective praise, modeling appropriate behaviors, and providing cues. Warmth and affection—even on bad days and when children are misbehaving—are critical to children’s well-being in early education. To connect the characters and situations in the book with the children’s experiences, Ms. Coz plans to read the book at least twice and also add it to the classroom library. During the second reading, she asks meaningful questions: “What do you think the characters are feeling?,” “How would you solve the problem?,” “Can you use words from the story to explain how you feel when you . 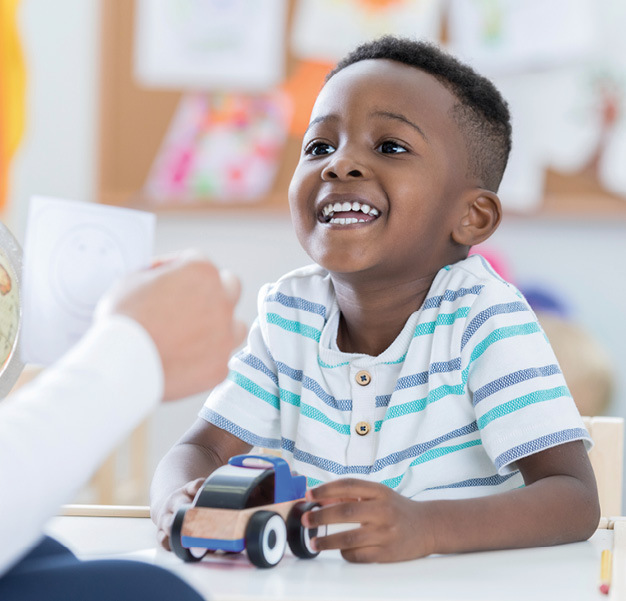 . .?,” “What could we do differently if this happens in our classroom?” These open-ended questions enable children to talk about their own experiences, learn new vocabulary words, and practice social and emotional skills. When they coach children on the spot, teachers help children realize what they are doing, understand how their actions affect others, and choose positive alternatives (Riley et al. 2008). For example, when Ryan and Ethan build a firehouse in the block area, Ethan grabs the fire truck from Ryan, and Ryan cries. Ms. Coz crouches down at Ethan’s level to look into his eyes; calmly and warmly, she says, “Ryan was still using the truck. When you took it away from him, he got upset. What could you do to make Ryan feel better?” After Ethan says he is sorry and gives back the fire truck, Ms. Coz says, “Next time if you want to play with the toy Ryan is using, could you ask if he will share?” Ms. Coz follows up by observing Ethan and providing immediate positive feedback on his desirable behavior. When children see teachers demonstrate these noninvasive strategies, they often smile, use their gentle hands, say please and thank you, give hugs and high fives, and use words to express their feelings. In addition to being role models, the teachers use the children’s appropriate behaviors to model social and emotional skills. They carefully observe and record details about how children apply the target skills, and they share their observations with the children through puppet shows during circle time. 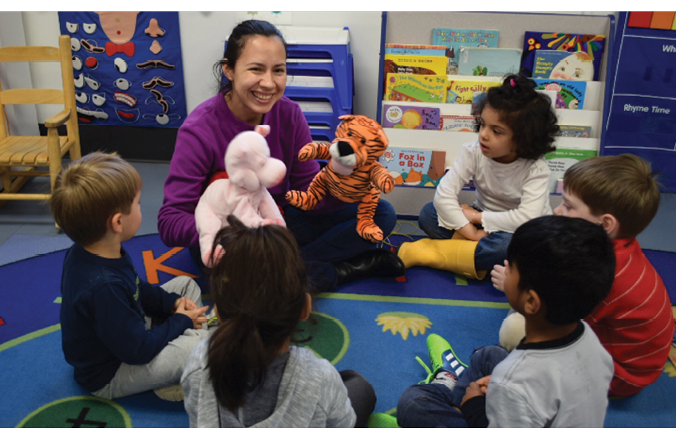 Using puppets to demonstrate children’s appropriate behaviors helps children learn social and emotional skills meaningfully. Both Ms. Coz and Ms. Carnes prominently display visual cues in their classrooms to assist children’s social and emotional interactions. For example, they provide teacher-made hand puppets to guide children to use quiet voices, helping hands, and walking feet. To help children calm down, they also created a “push wall”—a designated spot on the wall to push anger out—and use puppets to demonstrate the strategy. These puppets, demonstrations, and explanations are essential for clarifying and modeling appropriate behavior—and the visual cues are essential for reminding the children to practice what they have learned. Long-term visual cues function like a third teacher in the sense that children use the cues to remind one another of solutions and appropriate actions. 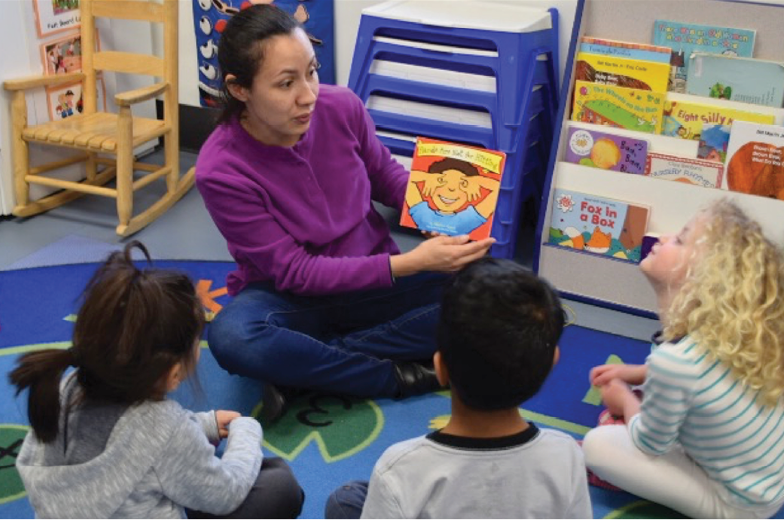 Teachers and caregivers promote children’s social and emotional health by establishing trusting relationships, created when teachers express warmth, affection, and respect. Teachers can intentionally teach and enhance these skills using evidence-based strategies to teach, model, and reinforce positive behaviors. As evidenced in the preschool classrooms we observed, teachers who prioritize developing children’s social and emotional health are richly rewarded with happy, engaged children who learn to avoid and resolve conflicts, share and take turns, and express their emotions in productive ways. Bilmes, J. 2012. Beyond Behavior Management: The Six Life Skills Children Need, 2nd ed. St. Paul, MN: Redleaf. Bovey, T., & P. Strain. 2005. “Strategies for Increasing Peer Social Interactions: Prompting and Acknowledgment.” Center on the Social and Emotional Foundations for Early Learning. What Works Briefs. http://csefel.vanderbilt.edu/briefs/wwb17.pdf. Dombro, A.L., J. Jablon, & C. Stetson. 2011. Powerful Interactions: How to Connect with Children to Extend Their Learning. Washington, DC: National Association for the Education of Young Children (NAEYC). Duffy, R. 2008. “Are Feelings Fixable?” Exchange 30 (6): 87–90. Gartrell, D. 2007. A Guidance Approach for the Encouraging Classroom, 4th ed. Florence, KY: Thomson Delmar Learning. Gordon, A.M., & K.W. Browne. 2014. Beginnings and Beyond: Foundations in Early Childhood Education, 9th ed. Belmont, CA: Cengage. Hyson, M. 2004. The Emotional Development of Young Children: Building an Emotion-Centered Curriculum, 2nd ed. New York: Teachers College Press. Katz, L.G., & D.E. McClellan. 1997. Fostering Children’s Social Competence: The Teacher’s Role. Washington, DC: NAEYC. Kostelnik, M.J., A.K. Soderman, A.P. Whiren, M.L. Rupiper, & K.M. Gregory. 2015. Guiding Children’s Social Development and Learning: Theory and Skills, 8th ed. Stamford, CT: Cengage. McClellan, D., & L.G. Katz. 2001. “Assessing Young Children’s Social Competence.” Champaign, IL: ERIC Clearinghouse on Elementary and Early Childhood Education. http://files.eric.ed.gov/fulltext/ED450953.pdf. O’Connor, E., & K. McCartney. 2007. “Examining Teacher–Child Relationships and Achievement as Part of an Ecological Model of Development.” American Educational Research Journal 44 (2): 340–69. Ostrosky, M.M., & E.Y. Jung. 2005. “Building Positive Teacher–Child Relationships.” Center on the Social and Emotional Foundations for Early Learning. What Works Briefs. http://csefel.vanderbilt.edu/briefs/wwb12.pdf. Palermo, F., L.D. Hanish, C.L. Martin, R.A. Fabes, & M. Reiser. 2007. “Preschoolers’ Academic Readiness: What Role Does the Teacher–Child Relationship Play?” Early Childhood Research Quarterly 22 (4): 407–22. www.ncbi.nlm.nih.gov/pmc/articles/PMC3856866. Raikes, H.H., & C.P. Edwards. 2009. Extending the Dance in Infant and Toddler Caregiving: Enhancing Attachment and Relationships. Baltimore, MD: Brookes. Riley, D., R.R. San Juan, J. Klinkner, & A. Ramminger. 2008. Social and Emotional Development: Connecting Science and Practice in Early Childhood Settings. St. Paul, MN: Redleaf; Washington, DC: NAEYC. Roberts, S.K., & P.A. Crawford. 2008. “Real Life Calls for Real Books: Literature to Help Children Cope with Family Stressors.” Young Children 63 (5): 12–17. Twardosz, S. 2005. “Expressing Warmth and Affection to Children.” Center on the Social and Emotional Foundations for Early Learning. What Works Briefs. http://csefel.vanderbilt.edu/briefs/wwb20.pdf.